What risk or uncertainties are we working with? What cause and effect scenarios do we need to know about? The answers to some of these questions lie in this next important stage of CRAFT, where a statistical tool called belief networks are used. A belief network is a way of mapping out relationships between variables (e.g. 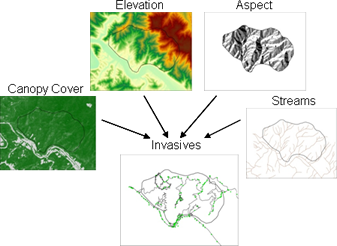 canopy cover, presence of invasive plants) and/or management alternatives, which allows CRAFT teams to predict the effect of their management actions. This provides a better understanding of the likely effectiveness of different choices. The CRAFT team begins this first stage of analysis by indentifying-- from their conceptual model and objectives hierarchy-- which variables they are going to model in their belief network. 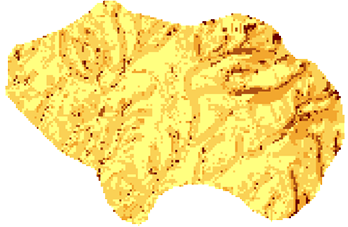 They decide the GIS data that they compiled earlier (canopy cover, elevation, aspect, and distance to stream) can be used in conjunction with additional existing data (presence, absence and unknown locations of Japanese Stilt grass within the sub-watershed) for this part of the analysis. Using a GIS, a team member compiles all of the data and exports it into one file. This file is then imported into the belief network software and a team member builds the network by creating and connecting nodes. At this point, the team can further define the probabilities of each scenario using the software. 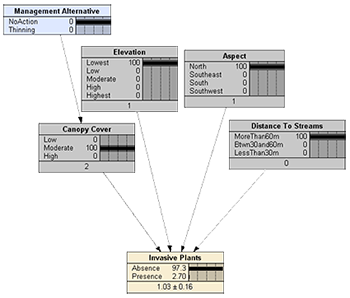 The data from the belief network software can be exported back into a GIS, in order to get a clearer visual picture about the probability of Japanese Stilt grass being present within the study area. The team can now use this risk map to evaluate how many acres are affected by Japanese Stilt grass and where the high risk areas are located. The ultimate strategy for the second stage of the analysis is to determine if different areas within the watershed call for different alternatives. This would be done by analyzing the cost, effectiveness and accessibility of the alternatives using a belief network. The results would then be used to project the environmental effects of each alternative across the sub-watershed.